I got out of town yesterday. I took a Metro North train thirty five minutes out of Grand Central to Yonkers, and spent the afternoon walking around the Getty Square downtown, strolling the boardwalk, and stopping by a cafe, dawdling over views of the water and the Palisades. I got the best kind of tour, from a family member who lives there. Yonkers is the fourth biggest city in New York State, after NYC, Buffalo & Rochester. It is both urban and suburban in nature, covering a wide geographical area, and evoking a varied sense of place. In 1894 Yonkers had the chance to join a consolidated New York City, along with Kings, Queens & Richmond County. The people of Yonkers declined the opportunity, just as later, the prospect of a subway connection to the Bronx was met with distaste. Yonkers has suffered the effects of industrial decline just like many American cities, and also been scarred by its infamous civic history of racism. But it's too easy for an outsider to rely on stereotypes about the city, which lead tony Yonkers college Sarah Lawrence to deny its real address, putting itself in Bronxville rather than its true location. Too bad. There's a lot more to the city than many imagine, with its wide range of income and ethnicity, burgeoning arts community, and (still) affordable housing options for people priced out of neighboring New York City. Visit, and you'll find a city with a vastly different demographic from its 90% white population forty years ago. Today Yonkers is 35% Hispanic and 18% African American, and has seen an influx of many different immigrant groups. If its downtown problems seem all too typically post-industrial, with high rates of poverty and urban blight, it also has a stunning (if precarious) post-industrial architectural legacy: a vast array of nineteenth and early twentieth century industrial, mercantile and civic architecture, along with earlier historic buildings, like Philipse Manor Hall, which dates back to 1682. And its riverfront location is both a glorious blessing - forging its identity and being, just simply, stunningly beautiful - and an amenity that developers can't resist taking advantage of. The public spaces by the water are a great resource for all citizens, but there's always a price to pay. The waterfront already has its share of high rise apartment buildings, but clearly there's a move inward, with all the attendant issues of displacement and destruction. We walked along Buena Vista Avenue, a lower income area tucked just above the newer river apartments, and saw graceful Victorians, some the worse for wear, and some lovingly tended, with fine old porches and mansard roofs, and the prospect of clear Hudson views. We stopped at a community garden, bustling with local kids, and chatted to the garden director. We also noticed the number of For Sale signs and feared for the future of the avenue. Later digging around revealed multiple-lot development listings. In the center of Getty Square, across from Philips Hall, a parking lot was recently removed ("daylighted") to uncover a buried section of the Saw Mill River. Imagine such a thing! - like Joni Mitchell's song in reverse! Running water always draws people in, and it was nice to see people standing in the park, looking down at the fish, reading about the river's path, and chatting to strangers about what they saw. It was amazing to think that a river had been right there, under the concrete, all along!. Everywhere there are possibilities. Today's the second day of the annual three day, non-stop WKCR birthday bash for Lester Young (August 27th) and Charlie Parker (August 29th). Yesterday you could hear 24 hours of Prez, and tomorrow there'll be non-stop Bird. Today you get a mix of the two jazz greats. It's beautiful listening! The MTA has issued another statement, to South Slope News, concerning the status of repairs at the Fourth/9th subway station. Much of the work at 4th/9th Ave Station is specialty metal work along with finishing the tower brick work. The work is progressing and their projected completion is the 4th quarter of 2014. NYCT staff is monitoring the progress of the work and if necessary will pursue other approaches should the work fall behind again. Other approaches? This sounds vaguely sinister. I've spent a lot of time hanging out at this station over the years, and seem to have accumulated a somewhat obsessive number of photographs of the place, including pictures taken at the start of the renovations in January, 2011. By now, I have little faith in the shifting completion dates the MTA grudgingly issues from time to time. I can only rely once more on the words of Second World War poet Keith Douglas, always appropriate for these institutional fiascos. "To live without hope is the best form of insurance. It does not mean to live hopelessly." 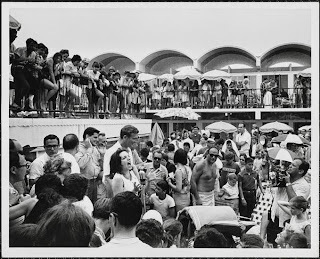 Though the season is winding down, let's keep the summer spirit going with this Katrina Thomas photograph of would-be mayor John Lindsay and a teenage Liza Minnelli entertaining a beach crowd in 1965. Now that's what I call a campaign! 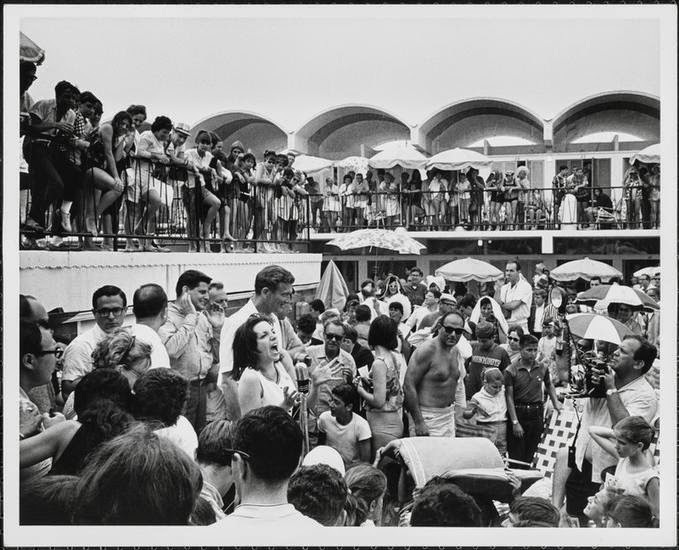 I've been enjoying looking at the digital collection of the Museum of the City of New York. 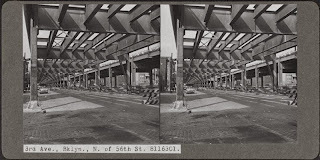 This Alfred C. Loonam picture, taken around 1940, at Third and 56th, marks the point I've got to in Part 1 of my 9th Street through Sunset Park walking tour. It depicts what I believe is the unfinished Moses Gowanus Parkway, the narrower, pre-Expressway elevated roadway built on the structure of the old Third Avenue El. "At the very moment that we have torn down our elevated railways, because of their spoilage of urban space, our highway engineers are using vast sums of public money to restore the same nuisance in an even noisier and more insistent form. 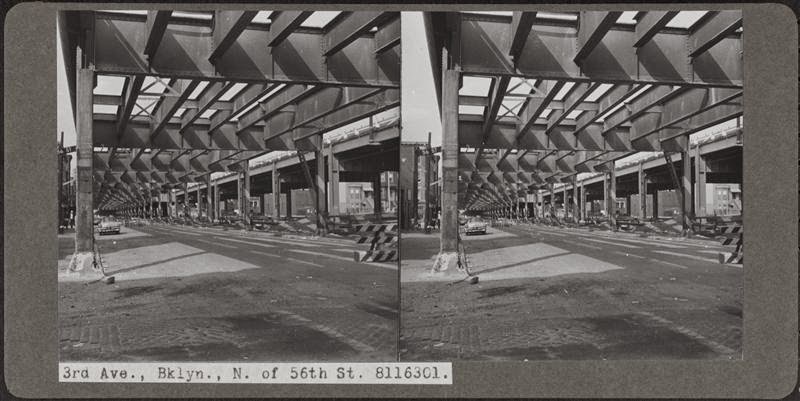 But what is Brooklyn to the highway engineer - except a place to go through rapidly, at whatever necessary sacrifice of peace and amenity by its inhabitants?" I'm going slowly. I think I'll walk as far as 65th Street, which is more or less the boundary between Sunset Park and Bay Ridge, though I have toyed with the idea of stopping at 59th, the Brooklyn/New Utrecht divide. Then it's off heading east to loop from Fifth to Ninth Avenues in the opposite direction, back north. I'm not exactly speeding along here, but if you do this too quickly you a) stop really looking at your surroundings, and b) forget what you've seen. And as I've learned a bit more about the history of the streets I've visited, I've become driven to go back to blocks I've previously walked. There's always more than you thought you knew, or saw, and nothing remains the same. The look of a block, the faces of a community, the you that walked a year ago and the you that walks today. The rustle of dollars in the all cash deals that tear down, build up, drive out, and the rustling shifts in the layers of history that form a neighborhood's identity. Some change is beautiful, and some very ugly indeed. I wanted to say I'd walked each street at least once, over a year or so, even if I happily fall back to more aimless meandering. A silly plan probably, but a strangely satisfying one. And I'm almost halfway there. Yesterday a number of these signs went up around the perimeter of 724 Fifth Avenue, the old White Eagle Tavern construction site. As I passed by, a concerned neighbor was editing the signs to explain that these were not issued by the NYPD and/or DOT. Presumably they've been put there by the construction company "working" (well, not in recent months...) there. She also drew my attention to the curious dates on the sign. May? The state of this site has caused a lot of safety concerns for nearby residents in recent years. We live surrounded by construction sites. On the home front it's been twenty months since work began next door. It's still ongoing. And on block after block after block you'll see a demolition site, an empty lot, a dumpster, an excavator, a cement block monster rising slowly above low-rise brick or wooden houses. Fifth Avenue in the teens and twenties is a whirlwind of activity. Corners are prime. Between Prospect Avenue and 25th, I counted eleven corners where there are either construction/excavation/repair activities (some of them stalled), permits posted for work, or property either recently sold or currently for sale. And of course there's plenty more activity mid-blocks. Walking home the other day, I saw that fences were up at the corner of Fifth and 24th (in front of the S. Batrouni Auto Service station, and next to the Citgo gas station) with a permit in place for tank removal and shoring. Does this presage bigger plans? A block south, a smaller auto repair business, at 732 Fifth, is on the market. "732 5th Avenue features 25' of frontage on 5th Avenue. This site is zoned R6A with a 3.0 FAR. Under the current zoning a developer could build approximately 7,500 square feet as-of-right. There is an Inclusionary Housing bonus which would allow additional square footage. There is an existing 2,500 SF industrial building on the property that will be delivered vacant. The property is located along in the highly desirable Park Slope South neighborhood, with many new construction projects in the development pipeline. " Even in the borough of churches, seven within three blocks seems like pretty good going. At 5205 Fourth near 53rd, the Templo de La Alabanza, formerly the Coliseum movie theater (see Montrose Morris's Brownstoner piece on the theater). The Coliseum closed in 1992. At the north-west corner of Fourth & 54th, two churches sit side by side. 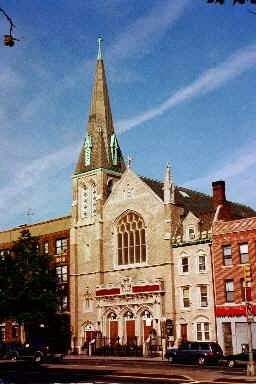 These are the Sunset Park Community Church and the Iglesia Adventista del Septimo Deo de Bay Ridge. The Community Church came into being in 1996, when Christ to the Community combined with Salem Gospel Tabernacle (formerly the Salem Scandinavian Pentecostal Assembly). The Salem congregation moved to its current address, formerly home to B'nai Jacob, in the 40s. Across the street from these two churches on the NE corner is the Iglesia La Luz Del Mundo, and south of them, below 54th, St. Jacobi Evangelican Lutheran. St. Jacobi's congregation was originally German, and founded a church at this site in 1909. Today its congregation is primarily English, Spanish and Chinese speaking. St. Jacobi offered significant space for Occupy Sandy relief efforts. At 55th Street, just west of Fourth, the Emmanuel Pentacostal Church. and on 55th east of Fourth, in a small brick building, Manna. At 56th & Fourth, the Bethelship Norwegian United Methodist Church (founded as the Mariners' Methodist Episcopal Church in 1874), which moved to this spot in 1949, via Red Hook and Carroll Gardens. Prior to the establishment of the church, the Bethel Ship mission, moored at Pier 11, in Brooklyn, ministered in an evangelical and social mission capacity to sailors and newly arrived immigrants, from the 1840s to the 1870s. Sunset Park is well known for its Scandinavian roots, but you can read an interesting article about the Scandinavian waterfront communities farther north in Brooklyn in this Carroll Gardens Patch article written in 2011. Last week I noticed that Hair Fair by Alberto was leaving its spot at 684 Fifth for premises across the street. Turns out they're moving to 681 Fifth, where the current tenants are Danny's Tailoring & Dry Cleaning. The note in Danny's window had me worried, because this is a great business, terrific for repairs & alterations. One of the ladies inside told me that they would be staying in the neighborhood, though the details seemed uncertain. I hope this works out - Danny's is just the kind of family business we need to keep around here. A Hair Fair sign in Danny's window yesterday. Danny's own sign above the store is already gone. has been and gone, as if it were merely a figment of the imagination! Sounds like more PR for another run to sell the historic Carnegie library, with the usual doom-laden picture of the building's condition. If the BPL could restore the Park Slope branch, which serves a significantly higher-income population, they should be able to fix some of the (often exaggerated) issues at Pacific. See more of the pitch here. Our library trustees ought to be on guard to protect our libraries as institutions. Shouldn’t they be fending off dismantling of the institution? One thing the Mayor, the Comptroller, the Speaker of the City Council and the Borough Presidents can all do ... is appoint representatives to the library boards who, leveling a critical and discerning eye, will shun no-bid contracts with the likes of Spaceworks and will send packing this Bloomberg-created privatefirm that is spending public money to privatize public space. If you haven't already done so, join in and sign the most recent Citizens Defending Libraries petition to save our libraries from development greed. Before it's too late. Ah - the beautiful water views from the Brooklyn Bridge Park! And there I was, perversely, watching the trucks go by. Back on High Street, a Mercedes competes with a Hatzolah Moments bus with painted-over windows. In Hum’s view, gentrification brought on by the robust real estate market is the biggest problem Sunset Park is facing. It has started to squeeze out the Latino and Chinese working families who cannot afford to rent in the neighborhood, let alone buy a home. Small businesses are also moving out because of quickly increasing property taxes and commercial rents. “It is similar to what’s happening in Manhattan’s Chinatown,” she said. Hum has concerns about the scorching real estate market in recent years, especially the projects launched by Chinese developers. She said the high-rise buildings and sprawling projects will turn Sunset Park into another Flushing, and they don’t fit in the working class-dominated neighborhood. “Rezoning for real estate developers to build high-rise buildings will further boost prices. It may be a good thing for business people. But for the working families living here, it means losing another neighborhood they call home. Neighborhoods that are affordable for the working class are fewer and fewer in the city,” said Hum. (Industry City developer) Kimball makes no bones that he’s leveraging artists and their events to create a savvy buzz around the development in a way that no printed marketing material or ad buys ever could.